The PlayStation 4 will be officially launched in Singapore on 19 December 2013 at a recommended retail price of S$639, Sony Computer Entertainment Hong Kong (SCEH) announced today at a press conference. The PS Vita TV’s release date for Singapore was also revealed: it will be out on 16 January 2014, and will sell for a recommended retail price of S$149. A S$219 bundle version is also available, which comes with an extra DualShock 3 controller. 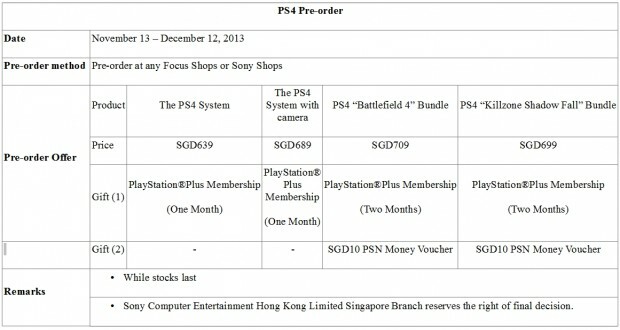 Customers can start pre-ordering the PS4 at all Singapore Sony Stores and authorised Sony retailers from 13 November to 12 December. A full list of all participating outlets can be viewed in this official press release here. No information was available for the release date and pricing of the PS4 in other Southeast Asia countries. However, SCEH did announce that a new regional warranty plan for six SEA countries (Singapore, Malaysia, Indonesia, Philippines, Thailand, and Vietnam) would come into effect on 14 November 2013. Customers who purchase a PS4 from the aforementioned countries will be entitled to one year of free repair service in any of those countries. In addition, 23 PS4 titles will be available for sale by the time the PS4 is released on 19 December. Some notable games include: Assassin’s Creed IV, NBA 2K14, Killzone: Shadow Fall, Knack, Need For Speed: Rivals, Battlefield 4, FIFA 14, and NBA Live ’14. Don’t ask me why there are two different NBA titles. If the Singapore pricing feels expensive, you are right: the pricing for the PS4 in Hong Kong was revealed last Thursday to be HK$3,380 (about S$546). This makes the Singapore PS4 almost S$100 more expensive, excluding shipping costs. However, the higher Singapore pricing is expected, because Hong Kong has lesser import taxes on electronic goods. You can view more detailed information about the launch games and the PS4’s system specifications in the official SCEH press release here. In the meanwhile, you can also visit the official PlayStation Asia Facebook page and official PlayStation Asia website to stay updated on the latest PS4 news.